The largest verified impact crater on Earth, Vredefort Crater in South Africa. 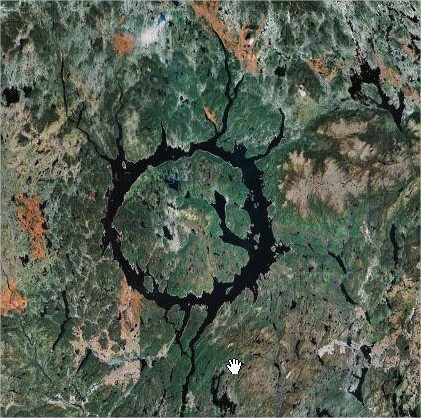 Measuring a staggering 250 – 300 km (155 – 186 miles) across, this crater was formed over 2 billion years ago by an asteroid estimated 10 km (6 miles) in size. Google Sightseeing is a great blog which in its own words states ‘ why bother seeing the world for real’ when you can use Google Earth! Well I guess it helps reduce the impact to the environment as a consequence of flying to these locations.